Dell's budget gaming laptop delivers for the price. With a GTX 1060 Max-Q GPU, the Dell G7 15 offers solid performance at a budget price point. 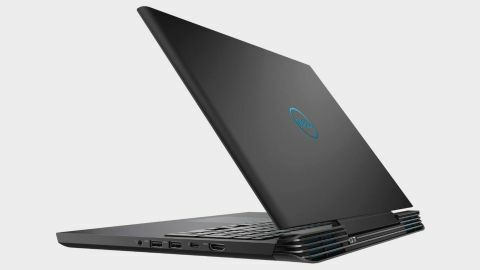 Dell touts its G7 series of laptops as a “complete sensory experience” for the gamer on a budget. Launched earlier this year, the line’s $1,180 starting price is an attractive number for those seeking the powerful portable gaming experience Dell promises. That price also puts it in direct competition with Acer’s Predator Helios 300, which landed on PC Gamer’s best gaming laptop list. After spending some time with the G7 15, however, I can say that it provides some of the best performance and value in the budget gaming class of laptops, and stands toe-to-toe with Acer’s offering. My first impression of the G7 on unboxing it was underwhelming. The look isn’t exactly modern and reminded me that Dell’s chassis design hasn’t evolved much in the last several years. Compared to other contemporary gaming laptops, the G7 is thick and boxy. First impressions aren’t everything, though, and the performance far exceeds the aesthetic. The G7 15 comes standard with an SSD, and every model above the most basic includes a 1TB hard drive. This is welcome value added in a budget range that typically doesn’t include much in the way of storage. The SSD and the 16GB of DDR4 make for a quick machine with little in the way of wait times. Benchmarking the G7 showed off the range and limitations of the GTX 1060, which averaged a respectable 73.3 FPS across three tests in Total War: Warhammer II. In Rise of the Tomb Raider, however, the system struggled to break 60 FPS. The average FPS for the Mountain Peak benchmark was 57.1, 53.75 for Syria, and 49 for Geothermal Valley. Ghost Recon: Wildlands was the most punishing benchmark for the 1060. At ultra settings, the benchmark averaged just 36 FPS, which isn’t surprising considering how graphically demanding the game is. Kick the settings down a couple notches, however, and you’ll get a perfectly serviceable performance. Comparing the G7’s 10,063 score on 3D Mark’s Firestrike benchmark puts its in-line with systems of similar specs. It also scored well in Cinebench R15, CrystalDiskMark Q32, and PCMark 10, making the G7 a great work laptop for those who do a lot of image processing and video editing. The G7 15 product page boasts Nvidia’s Max-Q design tech, but the model I used was surprisingly loud. Running benchmarks was a noisy process, and I often had to turn the volume up to hear games and videos. The tradeoff seems to be that the system never got very hot which is better for system health in the long run. Still, one of the advantages marketed by Max-Q design is the minimal noise output, so it was disappointing to hear the G7’s roaring like a wind tunnel. Another selling point of Max-Q is size. Weighing in at over 6 pounds, the G7 is a heavy machine that falls short of delivering on Nvidia’s promises—it’s definitely more suited for desktop use rather than lap use. The tradeoff is a full-featured keyboard featuring a number pad and smart key layout. I did accidentally tap the touchpad a couple times thanks to its close proximity to the spacebar, but once I got used to it it wasn’t a problem. Unfortunately, there’s not a lot of customizability in keyboard backlighting or brightness, but that’s to be expected in a budget build. The G7 does nail the final selling point of Max-Q; it boasts some incredible acoustics. The speakers pumped out some of the best sound I’ve ever heard from a laptop. Gunshots and explosions were crystal clear, and watching Avengers: Infinity War was nearly as immersive as on the living room TV. During testing, the four-hour battery life wasn’t an issue, but I do wish it lasted a bit longer. Being a budget system, there are some compromises that had to be made regarding some quality-of-life features. For instance, the refresh rate on the screen is only 60Hz and the battery is just 56 watt-hours. These aren’t deal-breaking specs, but the higher refresh rate of pricier laptops was missed in my time with the G7. The budget gaming laptop market is a crowded one, but the G7 15 manages to stand out thanks to its price-to-performance ratio. There’s not a lot Dell could have done better without raising the price by a significant margin. The bulk and noise are unfortunate, but a workhorse system with a GTX 1060 at just over a grand is terrific value.